Are you living your everyday life in safety – free from injury and sickness? Being inattentive for even just a moment can lead to you taking a tumble on the stairs and injuring yourself, or cutting your finger with a tool. In other words, our daily lives contain many hidden dangers that pose a threat to our safety, such as unsafe conditions or unsafe behavior. This led to the founding of hazard prediction activities (or kiken yochi training (KYT) in Japanese) in workplaces in Japan. 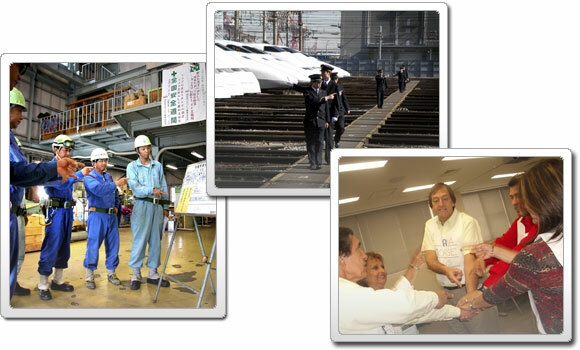 KYT is a training method whereby, through pre-work meetings or other procedures, workers are given advance warning of these kinds of unsafe conditions or unsafe behavior that are in their immediate sphere of activity, thereby ensuring their own personal safety and the safety of others around them. We have summarized the main points of this technique in the following 15 languages so that people overseas can also use them. Our hope is that these documents will be utilized in workplace safety education, and that, ultimately, Zero-accident in workplace will be achieved. LZH and ZIP files provided underneath are the compressed images (JPEG) of each page. Please be noted that Adobe®　Reader® should be downloaded in advance in order to view these publications.